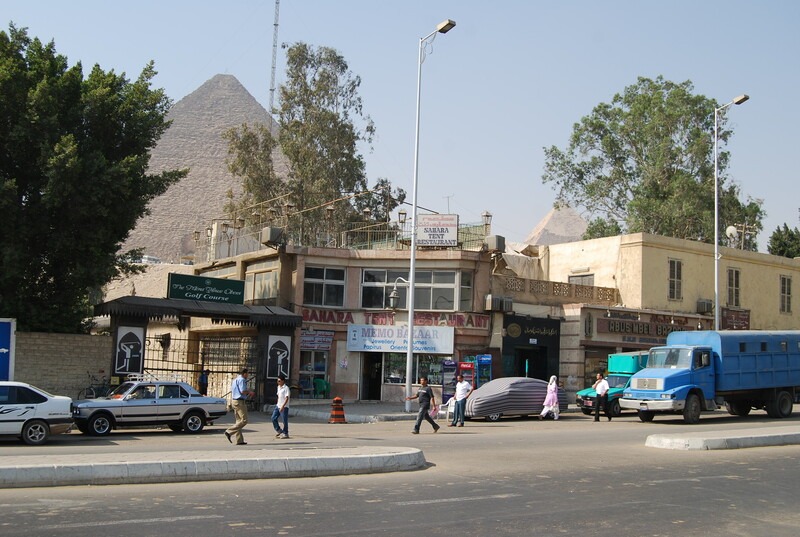 We were up early this morning for the half hour drive to the east bank of the Nile River to see this country’s star attraction: the Great Pyramid of Khufu and the surrounding eight pyramids that comprise the complex. Most people don’t realize this but the pyramids are not in the empty surrounds of the Sahara Desert. Instead, they’re found in Giza, a squalid suburb of Cairo, with filthy streets, decrepit buildings and people living in squalor. So while our first glimpse of the pyramids was breathtaking, the surrounding view certainly left something to be desired. As one would imagine, Egypt’s largest tourist attraction was mobbed with tourists and those hopping to make a buck off of them. 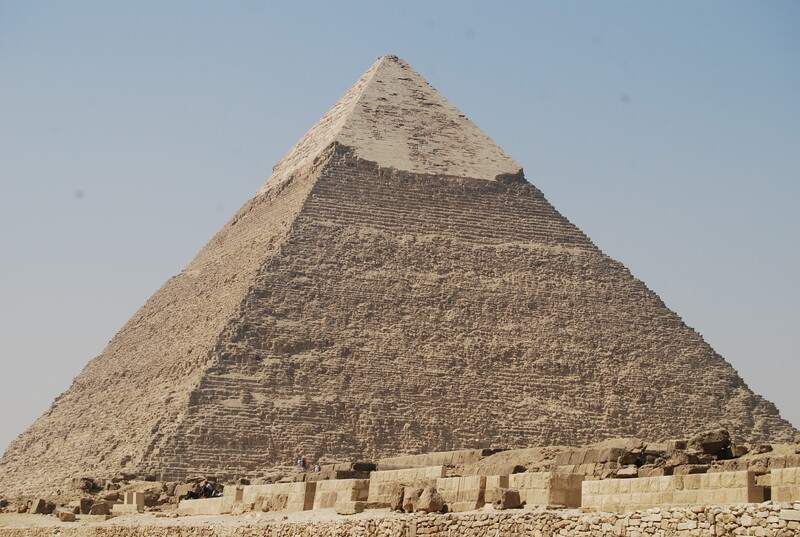 While it was hard to ignore the touts of the camel and horse rides, it took only a face-to-face with the Great Pyramid, built in 2570 B.C., with its 2.3 million blocks, each weighing between 1 – 11 tons to really knock my socks off. Look at the size of these things! 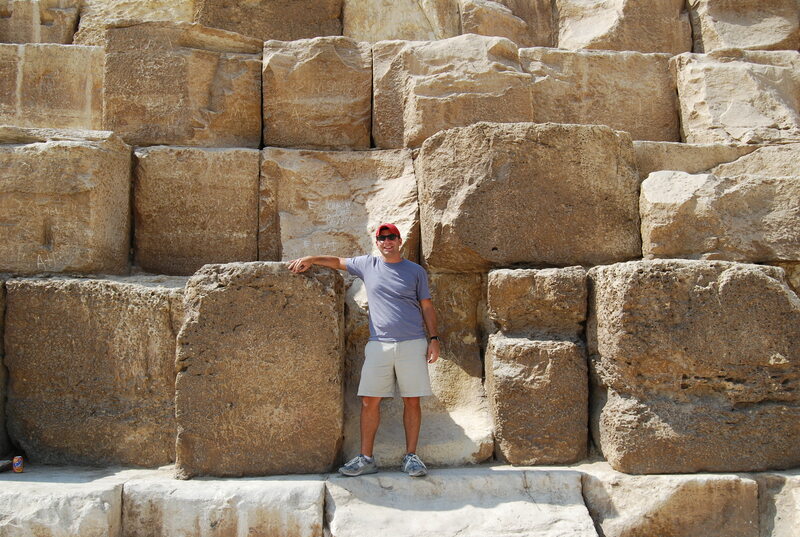 We found some relief at the Pyramid of Khafre, the second largest pyramid at Giza. Some of its limestone covering remains at the peak and a claustrophobia-inducing walk through a tunnel to the tomb provided an inside perspective on how precisely these pyramids were built. A panoramic vista from above showed the three largest pyramids. It’s hard to tell because of the air pollution, but the city of Giza sits off in the distance. Our last stoop was the Sphinx — which was much smaller than I’d imagined. 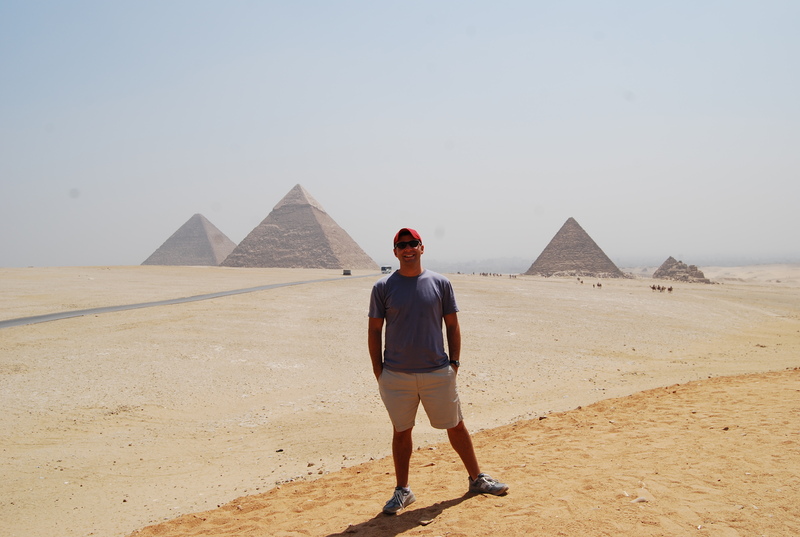 I’m not sure if that was because of expectations or because we had just finished touring the massive pyramids. 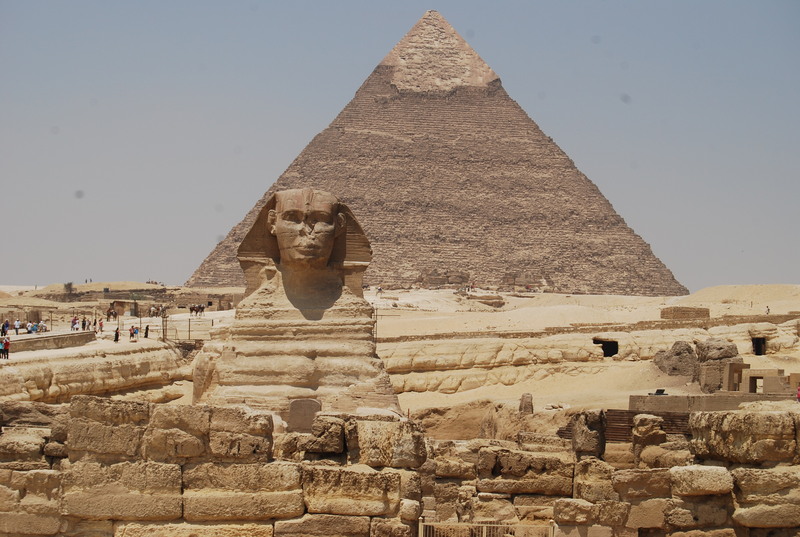 It was no less amazing to see in person though, with the Khafre Pyramid looming behind it. After a quick lunch, we visited the acclaimed Egyptian Museum. Habitually under-funded and rarely renovated in over a century, it feels more like a warehouse filled with an astonishing 120,000 relics from around the country. With the dizzying number of exhibits and few signs in English, we were thankful to have Hany to guide us through it. Most impressive, at least for me, was seeing the findings from King Tut’s tomb. The level of preservation — for artifacts more than 4,000 years old — was astonishing. Our overnight sleeper train to Aswan, a city 900 km south of here, leaves in about 2 hours. You’re right about the Spinx, it looks mini! Weird.